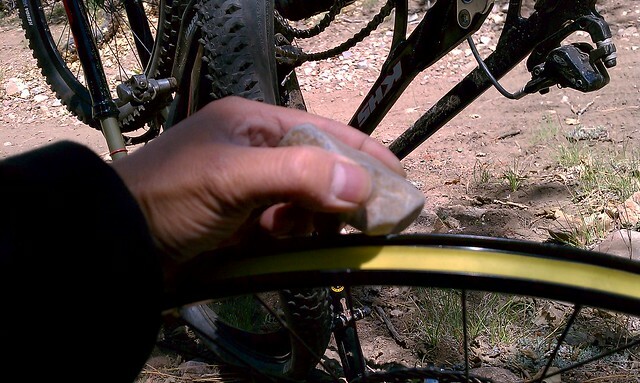 While we were at Big Bear during the Memorial Day Holiday, I ended up getting 2 flats in 5 minutes. I realized that I had hit a rock so hard that it slightly bent my rim. But the worst part, the rock created a small burr (sharp edge) on the lip of the rim. This was the culprit to my 2 flats. Since I used my my last 2 tubes, I started hiking down the mountain. About an hour into my hike, a fellow mountain biker stopped and threw me a new tube, thanks Stranger! But before I installed the new tube, I needed to address the burr. Forgive me for my crappy cell phone photo…I don’t own one of those fancy iphone thingies…You can kinda see where the rim bent. The inside of the rim had a sharp burr that punctured my tubes. Since I didn’t have a file, I grabbed the next best thing, a rock! Yup, used that puppy to grind off the metal burr. Viola! 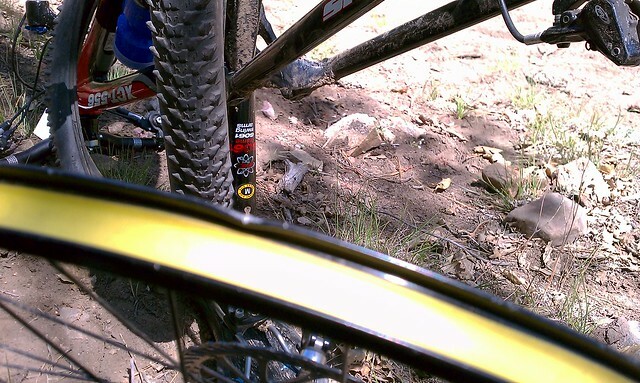 After my trail side repair, I mounted the new tube and inflated the tire and I was rolling back down the mountain. Every time I think about it, it makes me sick. This past Friday at 12:30 in the afternoon while in Stockton, California visiting family, I took the kids to Victory Park to relieve the wife of her parental duties for a couple of hours. My teenage daughter stayed in the car with a headache and nasty cough while I watched my 5 and 3 year old boys on the playground 20 yards away. My one-month old black Niner Jet 9 was on the back of the van’s rack when two goons decided to take it from me. My daughter, in the front passenger seat, looked up and saw one guy standing just outside her window. He smirked at her. Feeling uncomfortable, she proceeded to pull out her phone and call me. As she was doing this she notices another guy at the back of the van taking my bike off the rack. By the time I picked up the phone and got the bluetooth in my ear, they were off with my bike and I couldn’t find them. My daughter later told me that she felt I was moving in slow-Moe. – always lock your bike. Before the park, I stopped off at REI to return a couple of things and peruse their gear. I, of course, locked my bike while shopping at REI. But as soon as I got back to the car, I took off the lock because it tends to rub the paint when the car is in motion. Yes, I know it’s a mountain bike and they’re meant to get dirty, scratched, used… My vanity led to my defeat. -check your insurance policy with regards to bike coverage. If you are unfortunate enough to not be covered, check out Consumers Advocate for reviews on insurance plans available in your area. By Friday afternoon, I was pretty much over having my bike stolen. 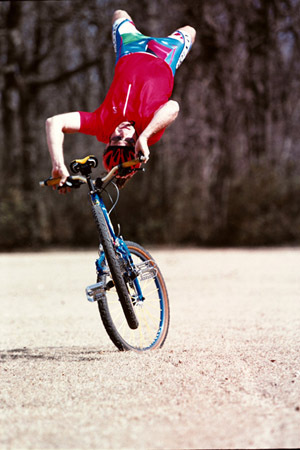 I was confident that my insurance company would “make me whole” with regards to the bike. However, when talking with the Claims Adjuster on Monday, I discovered that the insurance will only pay out up to $1,000 on a stolen bike. Umm… that does not even cover the cost of the FRAME, let alone the whole bike. 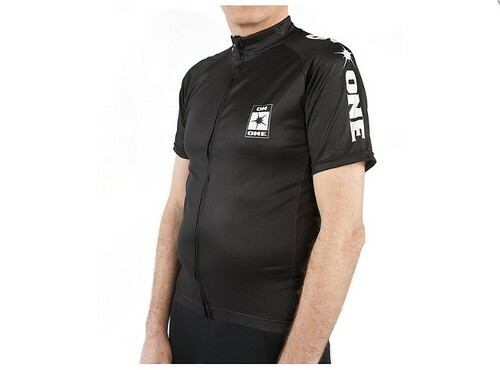 Personally, I’d like to see RL rock the new MtnBikeRiders.com jersey. Who wants to see that? Respond in the comment section! Also known as upgraditis, blingitis is a debilitating disease that subconsciously alters your perception of your current bike from a capable bike to one in desperate need of improvements (necessary or unnecessary) that look better but may not perform better than previously installed parts. If left unchecked, this mind altering disease can lead to high credit card bills, mounting debt and bankruptcy. Other negative side affects include the alienation of non-biking members of the family/friends and being able to only afford saltines for breakfast, lunch and dinner. Currently, blingitisâ€™ origins are unknown. 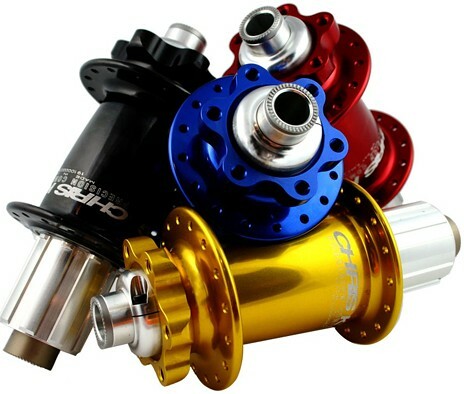 One scholar believes that blingitis is caused by mountain biking with other riders who actually do have better bikes/components than the diseasedâ€™s current rig. This scholar goes on to surmise that after examining the other dudeâ€™s bike, hormones named SPENDergen are released. SPENDergen has been shown to have a very weak correlation to the onset of blingitis. Another scholarâ€™s study illustrates a weak relationship of blingitis with attending major bike events such as Sea Otter, Eurobike or Interbike. A slightly weaker relationship was observed for riders attending local bike races where advertisements and exhibitorâ€™s booths are commonly found. This scholar supposes that the sensory consumption of so many cool components through a personâ€™s vision, touch, smell and yesâ€¦ even taste could set off blingitis. What are the symptoms of Blingitis? Blingitis normally starts off relatively harmlessly. $10 spent on a new set of grips because the old ones were black. Next, its $20 for a Salsa seat collar that matches the highlight color of your frame. But, be careful because before long blingitis can quickly spiral out of control. $160 for a set of Twenty6 Dualie Brake Levers, $600 Formula Oro Puro brakes and of course the ultimate bling $1,000+ Industry Nine wheels (two sets of course as each oneâ€™s color needs to reflect your mood). Sadly, if youâ€™re already this far along, it is time to call for professional help. Your doctor may prescribe you narcotics to reduce your desire to continue blingitis. However, this is normally not enough. We here at MtnBikeRiders.com highly recommend the expert in house team trained in the treatment of blingitis, the MtnBikeRiders.com.blingitis.team. This highly skilled team will come in and disassemble all of your current rigs and replace all of the blingitis parts with ho-hum parts from Walmart. We will also handle the removal of the blingitis parts so that you will not be tempted by them again. Our services continues with taking your credit cards and charging them up to the maximum so that you can not upgrade your bikes again. Lastly, we will help in relations restoration with members of your family and your friends who were alienated by blingitis. Surprisingly we do this all free of charge. How can I prevent blingitis? If you ride a cheap bike, we highly recommend marrying a spouse who has no degree of bicycle acumen, hates bikes and is poor. This combination of unknowing, unapproving and unfunded spouse is the best way to prevent blingitis. If youâ€™re already married and your spouse loves bikes you’re screwed. Umm… I meant that preventing blingitis will be a more difficult proposition. The team at MtnBikeRiders.com does have a recommendation: the surgical removal of your hypoSPEND gland. This short 17 hour surgical procedure will remove the hypoSPEND gland which produces the SPENDergen hormone. Remember however, that the SPENDergen hormone only has a “weak” correlation with the adult onset of blingitis. 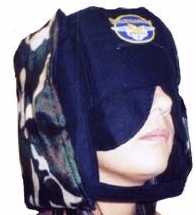 Your doctor may also prescribe Bike Component Sensory Deprivation. 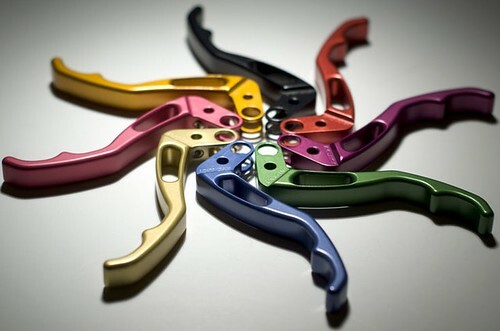 Although MtnBikeRiders.com does not recommend this, we have heard of great responses to this treatment. BCSD includes but is not limited to removing the internet from your computer (yes, itâ€™s only on your computer), house-rest to keep you from visiting cool bike shops and of course staying away from Interbike 2007. With a steady diet of BCSD you may see enough progress to visit your email account by year 3 of this treatment. Good luck.